In the esteemed words of Snooki… the party’s here! Woop woop, the tree is up. 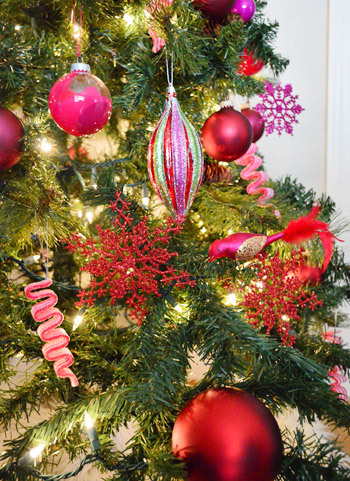 And this year now that Clara’s a big girl who we think can handle real ornaments (well, we got a few shatter-proof ones for the very bottom just to be sure) we went with a gradient from white to hot pink to red. Booyah. Or as I’ve been saying way too often: boom goes the dynamite. Oh and we have a bunch of meaningful/special ornaments that we love the most, but we save those for our real mini tree (we got a tabletop one last year and loved it so much that it’ll be a tradition). So we’ll post about that one as soon as we get it (don’t want it to die before Christmas, so maybe next week!). Anyway, back to our gradient guy. We thought it would be fun to see the color get deeper as it got closer to the floor, and since we already had a bunch of white ornaments from our silver tree in 2007 and a bunch of soft pink ornaments from 2010 and homemade ones from last year’s Pinterest challenge, all we did was grab a few more hot pink and red ornaments (which only ran us about 12 bucks total, thanks to 50% off sales at Michael’s and Hobby Lobby). Let the record state that hubster wanted it just to go from white to red with some of those silvery pink ones in the mix since we already had them, but I’m a smooth talker… so that’s how hot pink ended up in the mix. 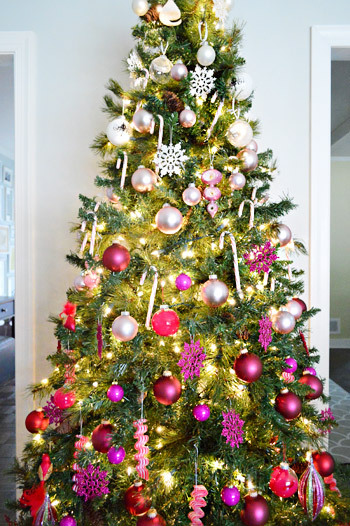 Then we just loaded each of the four colors onto the tree in bands of color with white at the top which led into light pink, hot pink, and bright red at the bottom. 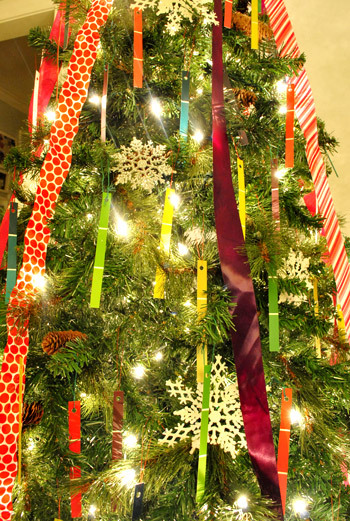 Oh and we added some $2 candy canes to the mix since they fit with the color scheme. But why tell you about it when we can show you? I love seeing Clara’s reaction to it after she woke up from her nap to see it all glowing and assembled. Maybe she thinks magic elves live here and work while she naps? I wish! As usual we used our faux-sheepskins-from-Ikea to make a tree skirt. Oh and check out that bicycle ornament we grabbed for cheap at Target. We also went sans topper. We’ve been waiting to buy one until we see one we totally love and that hasn’t happened yet, so wait we must. Here she is at night. I’ve named her Glowy Glowerson. And since I’m a list freak, here’s the rest of the stuff on my holiday wish list. I try not to be all stepford and pressure myself about it, but I can’t explain the endorphin rush that I get from crossing things off of a list. And don’t think I won’t cross things off even if I don’t do them if I run out of time, just for the satisfaction of crossing them off, because I totally roll like that. make an advent calendar for Clara? Ahh I’m behind already! Feels kinda festive, eh? What are you guys doing to get into the holiday spirit? Or are you screaming “not ready!” and boycotting Christmas Carols until a certain magical “now it can be Christmastime” date? Are you making a list just for the satisfaction of crossing things off? Are you making anything homemade (gifts, food, advent calendars, etc)? Do tell. Psst- Still in the mood for more holiday projects and pics? 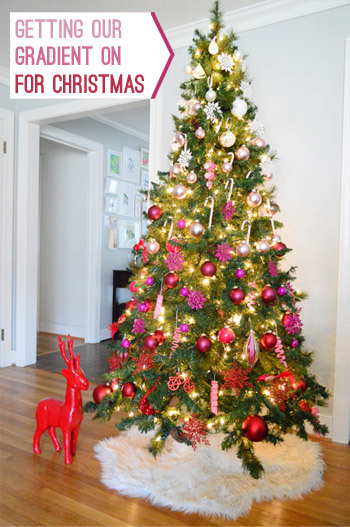 Click here for a gallery with over 25 holiday projects and ideas. 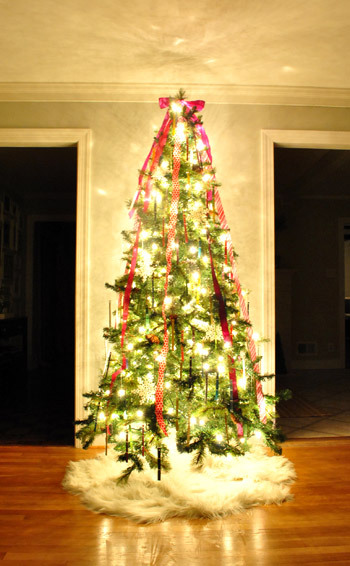 We use one of the big red ribbon bows for a tree topper. It was a temporary solution and 3 years of using it later, we’ve decided we love it and it is here to stay. I love the ombré! And way to sneak the pink in there!! I’d never get away with that! Christmas trees are probably (definitely) my favorite thing in the whole world and I wasted no time in putting mine up. Funny story, there are a lot of my mom’s friend (and my mom) that hate putting up Christmas decorations, and they used to pay me to decorate their trees and houses and such. Best job ever! And it’s still a great way to get some extra shopping money when I’m home on break. Oh my gosh, that’s SO MUCH FUN! Best job ever! Oooooo Aaaaaaaa. I’m loving the gradient. Loving it. 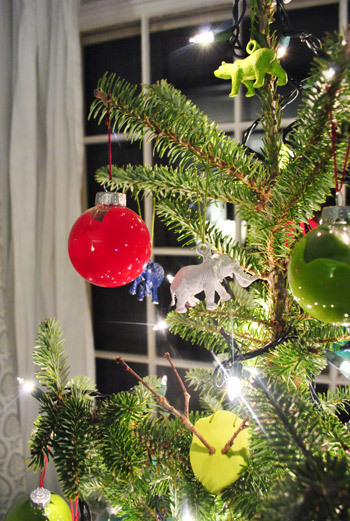 We went anti-red on our tree this year and stocked with navy, light blue and gold and Greta is NOT ready for not shatterproof ornaments yet which made my trip to the dollar store to get some really big plastic bulbs and snowflakes they had more for her…not me….right? Three cheers for Christmas shopping at the dollar store! Wow! That sure was inspiring. A different tree every year. Ours looks the same every year! Wowsers! Ahhhh! You’re so sweet! We loved meeting you! Thanks so much for coming out. And we hope you LOVE the book! We put up our tree as well! 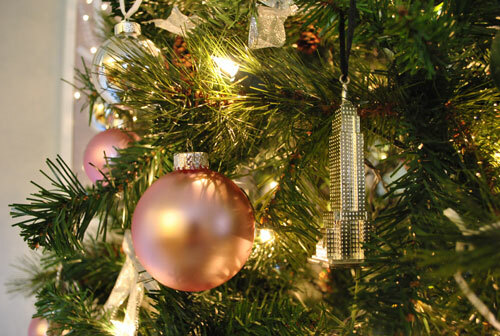 We’re sticking to the same theme as always – ‘no theme’ since we’re too cheap to buy new ornaments. Plus it was easier to put up what we’ve got! Maybe I’ll buy some ribbon… or make popcorn strands! Do people still do that? Yes! And gingerbread ornaments! So cute! so pretty! love the gradient! 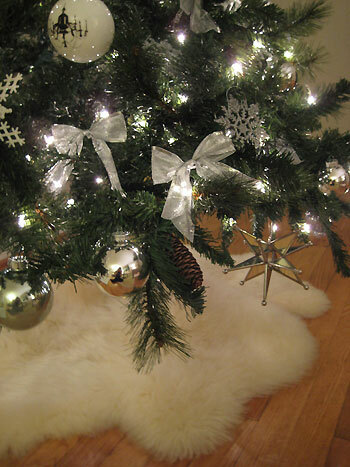 and I’ve always loved the faux-sheepskin tree skirt. This year, my daughters helped decorate the tree, so all the ornaments are on the bottom 90% of the tree. My husband asked if I was going to rearrange the ornaments after they went to bed, and I thought about it but decided against it. Now that it’s been up for a week, I swear my kids have memorized the location of every ornament, and they tell me when their sister moved one of “their” ornaments! Thanksgiving and Christmas totally snuck up on me this year due to the hurricane – I feel like I lost 2 weeks. So I’m trying to get into the spirit but I already feel like I’m behind! I LOVE IT!!! SO FUN! I’m curious, and I am sure you have answered this before, but why not put the tree in the living room against the fireplace? We love to look at our tree while we are watching Christmas movies. Seems sad to not be able to relax next to it. But, again, it looks great! We had it in the living room the first Christmas we were here but we hated that it was the back of the house so you couldn’t see it outside! Putting it on that wall means you see it from the office, the kitchen, the dining room, and even the hallway to Clara’s nursery and our bedroom, so we see it lots. Can’t see it from the couch though, which I agree is awesome! Maybe we’ll alternate where we put it back and forth?! at least you’ll have the tabletop one in the living room for some Christmas ambiance! We just sit on our rumps too much in the living room! Haha! I love, love, love this gradient idea! :) Y’all are amazing as always. I was going to share our advent calendar with y’all cause it is the easiest one I have ever done. Aaaand is recycled! Gotta love that right? I really like the shaded ombre thing. Your tree has got style! Haha. 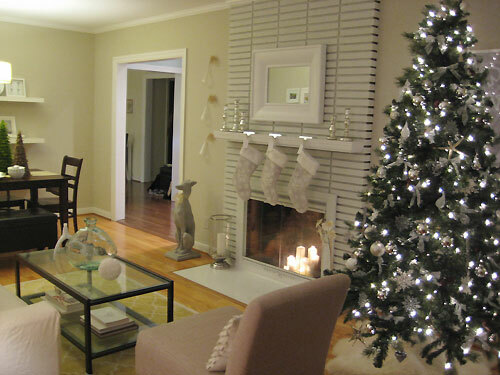 I posted a sneak peek of my plans for our decorating our tiny apt on my blog. Feel free to go check it out! It involves teal, gold, natural wood touches & lots of glitter. Doing it on the cheap this year! Sounds so pretty! Off to check it out! Yay for Christmas Trees! We put ours up last Monday. I decided that I didn’t like my old tree skirt so I made a new one over the weekend. Totally “Pinterested” one with canvas drop cloths and a hot glue gun. It looks amazing! It was so good seeing you yesterday at the book signing. You guys are so sweet. Peres was bragging all night that she got to meet you (again). Haha- we had the best time! Thanks for coming out- and the new tree skirt sounds so pretty! Clara killed me with her “this is cool, but I just woke up from my nap…oh, wait? CANDY CANES!” demeanor. Heh. That’s all John! You can see from the video that I play the roll of the tree “fluffer” and John actually assembles the whole thing. Hah! I’m giggling out loud at the two of you being tree fluffers. Dirty! Heh. Ooh that would be fun! I love your gradient tree, you got me in the Christmas spirit! We are moving Dec. 20th and so we decided we shouldn’t even bother setting ours up this year, since it’ll be so much work to take it down. But, this post convinced me otherwise! I’m doing it because I love seeing the tree all aglow. 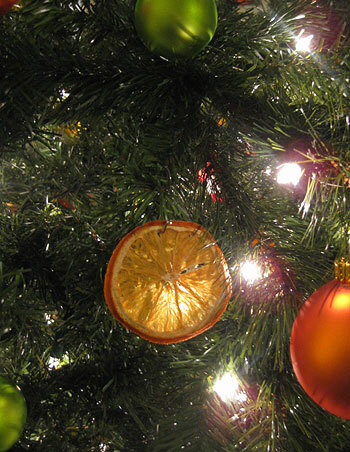 It was fun to take a look back on all of other creative trees – so inspiring! Also, I never commented (I meant to!) but I’ve been adoring John’s basement organization posts – the pegboard and Instagram pics are so awesome. Cleaning/organizing/pretty-ing up a space gets me giddy! Got my tree up this weekend. I didn’t put anything around the bottom since my baby is one but suprisingly she has not paid attention to it at all. All the ornaments are shatterproof anyway though. 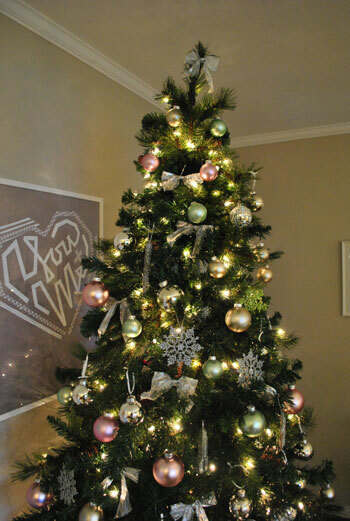 I also decorated one tree outside with huge ornaments and garland. I still need to get the stockings hung and the outdoor wreaths up. What a lovely tree! We’re looking to buy a real one (chopped down one, sad face as I’m killing a plant) this year as our fake ones are a bit too big. Here’s to hoping we finish our closet/storage in time to make room for the tree. I was reading that real Christmas trees shouldn’t be stored indoors for more than a week. Which leads to my question- how has your live tree fared? Did you plant it? Do you have it stored in the sunroom year round? We just did a little tabletop one last year (real) and we loved it! We couldn’t find one with a root ball we could plant (they were all cut little ones) so it lasted a few weeks inside and then died and dropped all the needles and we took it out back to the compost/nature pile! Haha, it’s true! It’s worm-ish for sure! Well….since you asked :)…I semi-finished the advent calendar (still need to finish the list of advent activities) which I used the scarf hanger from ikea to do and I have a stick tree in the works for the wall, we have a faux mini tree up and eventually we’ll do a big tree (we’ll wait a little longer since our little one would love to pull it down) and some more random decorations. Besides Christmas, we’re also busy getting ready for Ruby’s 3rd birthday party this coming weekend making her a cabinet kitchen and DIYing the decorations! 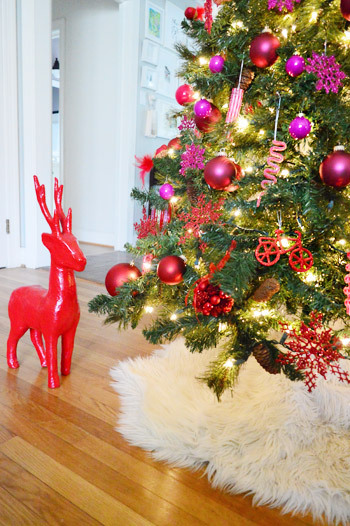 You have got to be kidding me – the ombre white down to red is exactly how I decorated my tree this year! I feel so cool right about now! OK. Did you intend to type “just for the satisfacation of crossing them off” or was it an oopsie? Because I gotta say, I’m totally feeling “satisfacation” as a word. It’s like satisfaction on steroids and I love it. As much as I love your ombre tree. Happy Hollydaze from NJ! Hahahahahahah totally didn’t mean to. But it works! Looks so nice! I am wondering though, do you think that once Clara starts bringing home ornaments from school that she makes that your tree will start to be less “themed”? My Christmas tree is FULL of sentimental ornaments that my husband and I made and that our son made, plus ornaments that belonged to my grandmother. I love taking these things out every year and decorating the tree with them just like I have since I was little! Also, we love snatching up ornaments from our vacations. Also, this year, I will be putting up a small “themed” one in my dining room. 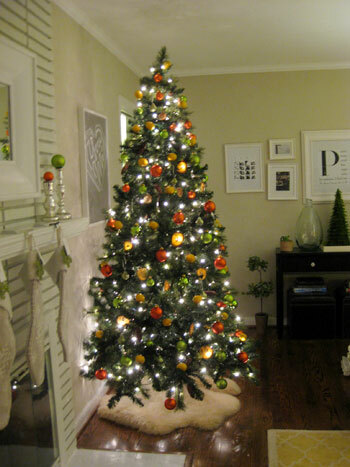 I love how different people are when it comes to decorating their trees, so I was just wondering! Oh and we have a bunch of meaningful/special ornaments that we love the most, but we save those for our real mini tree (we got a tabletop one last year and loved it so much that it’ll be a tradition). We’ll post about that one as soon as we get it (don’t want it to die before Christmas, so maybe next week!). Awesome! Can’t wait to see! Well, actually, we put up one 7 foot tree with all of our colorful store-bought ornaments first. Then we have a second 7 foot tree that’s going to be all handmade ornaments. I handmade an advent calendar out of muslin bags and branches, and I’m baking one handmade pie each week from Thanksgiving to Christmas, I’m making at least one gift per person, and I’m hosting a special “handmade” gift exchange party with a few friends. I’m thrilled. Oh, and I should mention that we have 8 Christmas trees this year, 3 miniatures outside, one each for our kids, one miniature tree, and two large trees. Sounds amazing. You did own it. Haha. Cheers! Very cute! We have an 11mo old so the tree is lightly decorated with non breakables on the bottom and since the 5 & 3yo decorated it’s a little heavy on some branches and one side while some sides and branches are completely bare! Oh well! I’ve been making ornaments. I can’t wait to share….but some will have to wait until after Christmas…they are gifts too! Whoop! Hahah, love the hash tags. Yes every year I keep walking back to it and staring at it. Haha. The drawing power of sparkly objects…. Do the 12 days of Christmas. That’ll give you time to do it and not feel ‘behind’, as well as give you more time to actually figure out what to put in there. Plus it’s more meaningful in my opinion. Instead of one every day of the month [where they come to -expect- it…] you’ve got 12, they’re more rare and coveted. Well… I think so anyway! Love, love, love this years tree btw. Well done! 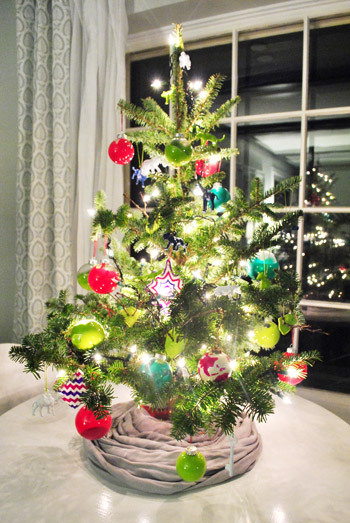 Your tree looks cool but I could never do one like this – I’m too attached to our sentimental and handmade ornaments. We buy ornaments as souvenirs and to commemorate special occasions, so our tree is covered with hundreds of different things. Oh yes we have those too and we use them for our mini real tree! We’ll post about that one as soon as we get it (don’t want it to die before Christmas, so maybe next week!). That’s so exciting!! So sorry we couldn’t make it Wendy. Sounds like so much fun! I love the progression of color! But I love even more that John was A-OK with it! Seriously, real men = pink. I like the creative idea! And the only thing that counts is that it’s what you wanted in your home at this fun time of the year and that it brings you joy (certainly seems magical to Clara!). 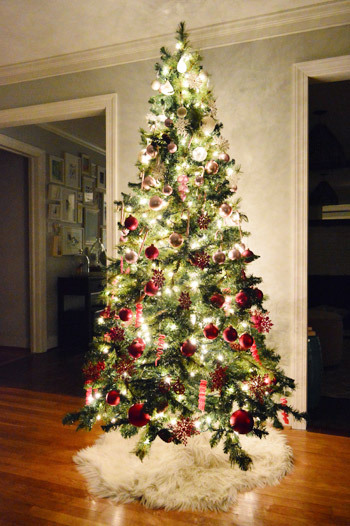 But I have to say, I’ve just never felt that my Christmas tree is ‘decor’. The ornaments are dated and scruffy, the sizes and colours don’t jibe, there might a couple of new homemade ornaments per season. But when I unpack them, those ornaments that’ve stayed with me for over thirty years now, that I can see in perfect detail with my eyes shut in the middle of July, that have stayed with me thorough moves, relationships, departures of dear family; they greet me like old friends, a cherished memory in each and every one. When it comes to Christmas tree, I’m more Charlie Brown than House Beautiful. And I wouldn’t have it any other way. Oh I totally know what you mean! We have a bunch of meaningful/special ornaments that we love the most, but we save those for our real mini tree (we got a tabletop one last year and loved it so much that it’ll be a tradition). We’ll post about that one as soon as we get it (we don’t want it to die before Christmas, so maybe next week!). 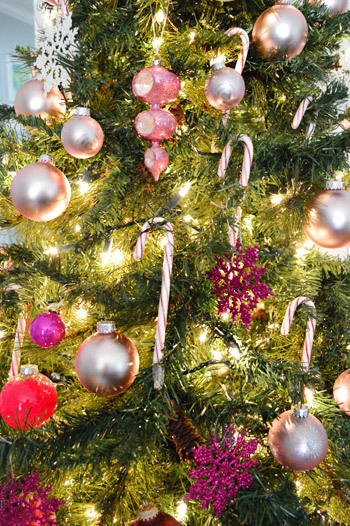 Love all of your festive trees! So much fun! As for how we store it, we’ll have to do a post. We have tupperware bins that are green (halloween is clear, christmas stuff is green) and we basically group stuff together (ornaments in two of them, lights for outside in one of them, etc). We’ll have to share pics after the season’s over! I love all of your trees, but I do believe this is my favorite yet!! 1. I walked into a bar in DC Saturday night and there was a girl reading your book at the bar. So I made a new friend! b. Did you see that used/like new copies of your book are selling for $900 on Amazon? Crazy! 4. It was wonderful meeting you guys at the FLOR event! Um, that is crazy! $900? Are they really selling? Methinks they’re not. Hahah! And as for the girl at the bar- amazing! I LOVE IT! And it was amazing to meet you at Flor Amy! So much fun! Tree looks great! We, too, are topperless this year, so I’m going to try and make one for cheapsies! 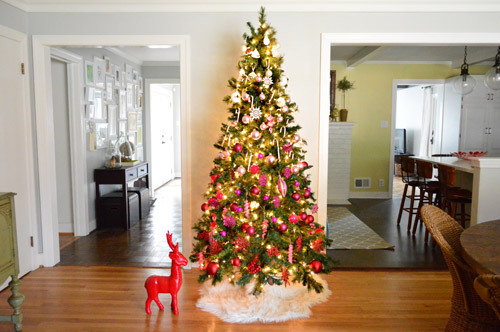 Beautiful…we have two rooms also and I keep thinking about doing one matchy matchy tree and one personal tree in the other room! Every year I love your tree, but this year it takes the cake! Love the ombre and you one up yourself every year. What will you think of next year?! Color me impressed (no pun intended). We decorated our tree too! But with 4 dogs around (one being a puppy), we made sure that have shatter proof ones at tail level- same thing as kid-proofing, right?! Yay for local businesses like Mongrel! I confess when I first saw the store name, I thought it was a pet store. Me = Duh. Haha, they’re awesome! We love Mongrel (many many ceramic animals there have been petted by moi!). Haha. It may have been 83 degrees in Big D this weekend, but cranked up the air and pretended we were up North. Wow, I’m a lurker, not a regular commenter… but I have to chime in to say that I LOVE this tree. It’s so pretty!!! Thanks for sharing the evolution of your trees. While we didn’t decorate yet (first priority is welcoming our little girl in today or tomorrow), we did get our shopping groove on at the thrift store and found some great stuff for 50 cents a piece for future projects! We also went for a hike and trial run yesterday. When it’s mid 50s in December, what else is there to do? Especially when the trail heads are under 10 min away! Oh, and since our place is smaller this year, we’re thinking of doing a Christmas Drawer- in the daybed. It’ll eliminate the need for presents on a counter and make for safer walking with a newborn. Love the photos! Looks awesome out there! Wow, I LOVE the gradient! I was at the mall this weekend and they had one tree decorated similarly (but in a rainbow of colors) and it was stunning…almost as nice as yours!